The past few months I have been conducting research on constructing my own medieval hard and soft kit and I have decided based on personal preferences, ancestral and financial reasons to recreate a mid 13th century French knight, using the Morgan/Maciejowski Bible as my main reference. While I've certainly learned a lot (a lot more to learn! ), it seems like a bit of a struggle in trying to find authentic pictures or fabric sewing/cutting patterns. For example, I'll look up a video on youtube that appears to be authentic, but then they put on a maille coif that isn't integrated with a rounded bottom. I look up videos on how braies are worn with chausses and I get 3 drastically different patterns. The helmet will have a brass cross in the center. A templar knight with a giant red cross in the center of his surcoat....argh! If anyone had resources on hand or could point out where I'm going wrong, I would greatly appreciate it. The soft kit I'm mostly making myself to ensure its comfortable and properly fits. As suggested, I am completing this before attempting any actual armor purchases. There's a book called 'the medieval tailor's assistant', by Sarah Thursfield. If you're feeling a bit overwhelmed by the volume of stuff on the internet (some good, some bad, and most of it terrible) I'd suggest investing in a copy. This depend on your budget and how autentic you want to go. White linen tunic - I would suggest a pattern from the french st Louis-tunic. blue woolen chausses - 1,5 metres of some 2/2 twill would take you a long way, cut on the bias. Go for a grayish blue that look like woad. turnshoes - your allbeststuff-link does not show turnshoes. belt - narrow and long, with D-buckle. gambeson - sew yourself or be prepared to re-taylor a commercial one. maille - demi riveted, round rivets. Be prepared to re-taylor it. As for the wool fabric, would something like this work out? Another question: I have a pretty big head. At my eyebrows it is a little over 24 inches / 61 cm and all the Maciejowski helms I can find have a diameter of 8 inches. Is that too snug if I plan on wearing a cloth coif + maille coif? If you are still looking for a helmet, I cannot recommend Patryk Nieczarowski enough. His early style helms are fantastic, and great quality. And he has made Maciejowski style helms before. Not too long ago I had a raised conical helm commissioned with him, and it turned out fantastic. Thought I would give an update on progress. After some consideration and reading the fascinating discussions, I decided to go with a custom made double layer linen cote instead of a gambeson. Not only for making a slimmer figure and being easier than making a gambeson, but it enhances my soft kit (did not know the unseemliness of wearing just an undershirt). I was also able to come across a faux wool fabric that has the look and stretchiness of real twill wool at a much cheaper price. It's a dark army green instead of the desired blue, but I'll just make due. 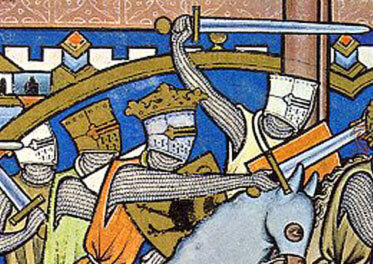 While assembling the soft kit, I looked further into selecting the right arming sword for a mid 13th century knight (circa Maciejowski Bible), and I've certainly run into an impasse. With a budget set aside for about $300 or (preferably) less, I've certainly found a lot of interesting swords (no Type XII ), but I find myself hesitant on several of them due to my lack of knowledge. Any input would be appreciated. So I was originally enraptured by this blade. 13th century, a massive discount, and I've seen a lot of positive reviews both written and on youtube. However AFAIK, according to Oakeshott, Type XIV is very late 13th century (1275) so its outside of my time period (yet shows up in the Maciejowski Bible?! Time-travelling crusaders?! ). I fell in love with the look of this sword, and the fact that it comes with an integrated sword belt, but I have heard of some people having minor issues with the pommel. Plus its apparently more of a 12th century blade/Type XI so I don't know if it would be appropriate. Finally, its really long and I don't know if it would be comfortable to wear and not have it constantly bang on the ground. Also really like this blade, but apparently this is a Type XI, so it might have the same problems as the Windlass sword. Also, it has side rings and from my research scabbards with side rings are more of a late medieval thing. I've heard some nice things about Ronin Katana, but it has the same issue as the Hanwei Tinker in that it has side rings with that design of sword belt I haven't seen in 13th century art. Plus the design of the sword itself looks too antiquated for the time period. Sorry in advance, I probably said a lot of ignorant things, but I think I'm getting there. FWIW..... back in the day when I did 13th century, I did not use an actual padded "gambeson." I referred to it as an aketon and it was 4 layers of hemp canvas. It was comfortable, did not limit motion, and offered rigidity under the mail. I'll chime in once more. I'm not an "expert" by any means, but I'm not sure I'd get TOO keyed up over the Kingston/ATrim sword being called a Type XIV. As Oakeshott himself says, dating a sword is difficult. And as you've pointed out, the Morgan Bible shows a lot of swords that could be reasonably interpreted as a Type XIV (or at least similar in profile to the Kingston sword). Type XI's might be a bit old fashioned by 1250, but there ya go. As for scabbards.... it'll be tough to find an accurate scabbard included with a sword in the bargain price range. The best you might expect is one that isn't awful, that you can add, say, a split style suspension to. I'd made one of those before and it's not too hard. Good luck! $300 is a pretty modest budget, especially if you're hoping to get a decent scabbard and belt thrown in. My suggestion would be to focus on the sword, if it comes with a scabbard that's just a bonus. Scabbards and belts are nice evening projects to do at home, swords are a bit more tricky. Focus your spending on things you can't make yourself. Out of the swords you listed, I think the Kingston Arms is by far the best buy. Regarding synthetic substitutes for natural fibers (linen and wool), you may find that synthetic fabrics don't breathe as well as natural ones so you might get a bit more hot and stuffy. Also if you're going to events don't get too close to the camp fire! I recently started a new full time job and as a result I decided to purchase a more expensive sword. I finally decided on the Sword of Saint Maurice by Del Tin. I think I might be waiting a few months for it to arrive, but I suppose it could be a late birthday gift. After reading the two threads on padding, I decided to not go forward with a gambeson and instead complement my kit with a turmeric colored double layered cotte. Not only do I like yellow as a color but I think it would go well with the army green chausses. I'm almost done making the belt for my soft kit, but I'm a bit iffy on how long it is (the longest leather strip I could find was 54") The most obnoxious part is trying to rivet the decorative studs. I thought brass was supposed to be soft but I'm pounding on the darn things with a ballpeen hammer and all its doing is pushing the rosettes into the table. Do these belt ends look alright for mid 13th century? I'm trying to find good pictures of mid 13th century hats that a French noble would wear, but I noticed the only ones wearing real hats in the Maciejowski Bible are peasants with straw hats, Jews with conical hats, and kings with crowns. I see tons and tons of documentation and illustrations of headwear for women in this time period but very little for men. Now apparently bycockets were worn in the 13th century, but I looked on medieval miniatures and I only saw bycockets in the 14th century. I think Chaperons are really cool, but they are out of my time period. I also really like the look of a simple wool hat like this, perhaps with some minor decoration like a feather or a broach? However, Revival Clothing is claiming its 14th century as well.